The Lute Prudencio Saez 55 is one of the lutes from Prudencio Saez hand made in Spain entirely with solids woods and beautiful craftsmanship. This special instrument is made with a solid spruce top, solid sapelly for the back and sides and ebony fingerboard. With its oval sound hole and its gorgeous machine heads, the lute Prudencio Saez 55 is an instrument that catch your eyes immediately for its beauty and attention to detail. The impecable sound of this lute speak for it self. Lute case Alhambra SI5732A . This strong and luxury special lute case is made from polyurethane and covered with leather like finish to make it very strong yet very light to carry. 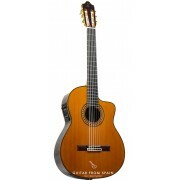 The interior is luxury fitted with soft cloth and fits perfectly your spanish lute with pear shape .